Alpine, the largest of the Far West Texas Towns included in our WH guides, is a lively small town with weekly farmers markets, historic hotels, and annual art festivals. Big Bend Brewing Co. was founded in 2012 in Alpine, Texas in the backyard of Big Bend National Park. The spacious brewery greets you with friendly faces and encourages you to play board games, try a tasty selection of beers on tap, and relax with friends . Kid-friendly. Dog-friendly. Located in the Holland Hotel, The Century Bar and Grille offers continental and regionally inspired Texas Bistro cuisine with a full bar featuring locally Inspired cocktails, fine wines and draft Texas Craft Beers. Diners can enjoy their meal in a variety of settings: the airy yet intimate Century Bar, the Chef’s Tables overlooking an open kitchen, a classically appointed dining room, or secluded outdoor dining in our hacienda courtyard. The original Reata Restaurant, the Reata Alpine is the birthplace of the legendary Reata cuisine and remains a true destination restaurant. Wanderers and travelers, loyal diners, guests at the famed Gage hotel, and wedding parties from Marathon come from miles away to enjoy our sophisticated cowboy cooking cuisine. If you're in the mood for a hearty chicken fried steak, Reata Alpine is the place for you. La Calavera opened in May of 2017 and has offered some of the best, most authentic Mexican food in Alpine. It’s a terrific spot to grab your food and sit for a while, enjoying the private outdoor patio dining in a courtyard with plenty of seating and a fire pit for chilly nights! Closed Sundays, but otherwise open daily from noon to 10 p.m. and until midnight on Friday and Saturday. BYOB if you wish! Call in orders at 432-294-2680. Opened in 2016, Cedar Coffee & Supply has brought fine coffee to the heart of Alpine. Dubbed "the best coffee in the West", CC&S owns up to the name and offers an impressive menu including espresso, lattes, and some food options. Crepes and gluten-free waffles, too! A pretty space, satisfying menu, and great coffee - CC&S is a recommended stop before your day in the mountains. The sister hotel of the Holland Hotel, the Maverick Inn happens to be a Boutique Motel in Alpine, Texas. Each of their individually furnished guest rooms are appointed with luxury amenities and expected conveniences, including a daily hot coffee bar and WiFi. Whether you are a hiker, astronomer, art enthusiast, biker, or just want to experience West Texas, you have arrived. The Holland hotel offers a range of accommodations from their tasteful penthouse to their Spanish colonial styled bar and lobby. Walking distance from shopping, galleries, dining, and entertainment, the Holland Hotel is closely connected to surrounding activities in Alpine and, if you're looking to spoil yourself, stay in for the night and visit their salon and spa Mendias and Co. for a luxury treatment. Sanctioned by the Working Ranch Cowboy Association, the Big Bend Ranch Rodeo provides an opportunity for working cowboys to show real cowboy skills and at the same time celebrate our ranching heritage and create exposure for a unique American lifestyle. Held at the Sul Ross State University S.A.L.E. Arena. A two-day free arts festival that fills Alpine’s galleries and streets with visual surprises and spirited live music. Don't miss one of our favorites- The Dimestore Cowgirl while you're there! The Big Bend is a playground for rock hunters who seek out its abundance of agate, jasper, quartz, and other colorful stones. Many of these are on display at the annual Alpine Gem & Mineral Show, a three-day event at the Alpine Civic Center where you can admire the displays and shop for beads, jewelry, and rocks! Every Saturday morning at 9 a.m. If you're just passing through and need a homemade treat or some fresh veggies, head over to historic Murphy Street (just East of 5th Street) for the Alpine Farmers Market. Get fresh veggies year-round plus baked goods, crafts and more! The Texas Cowboy Poetry Gathering is a two-day event in Alpine celebrating the oral tradition of the working cowboy in poetry, stories, and music. Enjoy more than 50 performers in the classrooms and on the stages of Sul Ross State University. Daytime sessions are free, and beginning Thursday at noon, night show tickets and programs may be purchased at the University Center on the Sul Ross campus- the official headquarters and information center during the gathering. Marathon, a small town and home to the Gage dynasty, is just 30 miles southeast of Alpine. With its charming restaurants, bars and shops, Marathon is a great final resting place before you venture out into Big Bend National Park. Target Marathon: A parody on ‘Prada Marfa’, the Target Marathon installation is Marathon’s way of alerting visitors to its sense of humor. The small town is homegrown and doesn’t take itself too seriously- conversely to Marfa’s perceived attitude of slight arrogance among the small far west Texas towns. James H. Evans Gallery: James H. Evans is a gifted photographer who has dedicated the majority of his career to photographing the vast landscapes of Big Bend National Park and the people who inhabit the region. His gallery, located a few doors down from The Gage Hotel, is worth a peak. His work truly captures the landscapes that Far West Texas is known for. The French Grocer: Marathon’s petite grocery store, French Grocer, offers a wide array of products. Fresh produce is limited but inventory is varied enough to where anyone can find something they like to enjoy or snack on. Tip: Great bandanna selection (for collectors out there). V6 Coffee Shop: Designed by Houston bar owners, this small and polished breakfast/ coffee spot is comfortable and tasty. A great spot to fuel-up before entering BBNP. The Gage Hotel: The Gage is a Far West Texas institution. Unlike other hotels of an older generation in the region, The Gage continues to update accommodations without compromising its original charm and allure. Before planning a trip, it is important to note that The Gage is the only real attraction or large establishment in Marathon. For that reason, I typically spend the last night of a long West Texas journey at The Gage. I recommend blowing it out at the famous White Buffalo Bar (located at The Gage) before heading back to your home city. Order a Ranch Water and/or a Prickly Pear Margarita and ask the bartender about the story behind the White Buffalo. For a few hours in a little town in the middle of West Texas, almost 500 racers bring everything they have to a race called the M2M. With dry, cool, high desert climate, gradual downhill, spectacular scenery, low traffic, and a downhill to the finish line, M2M includes a full marathon, half marathon, 10K, and 5K! A two day celebration of song and story hosted by The Gage Hotel. With Intimate performances by five master songwriters in a setting that exudes luxurious comfort and charm surrounded by a landscape that captivates and inspires– welcome to the Marathon Songwriters Festival. Located in Post Park (Fort Peña Colorado Park), the West Fest Cabrito Cook Off and Dance is one of Marathon’s most popular events! Join in for singing, dancing, and good ole West Texas cookin' you can only find in Marathon, TX. 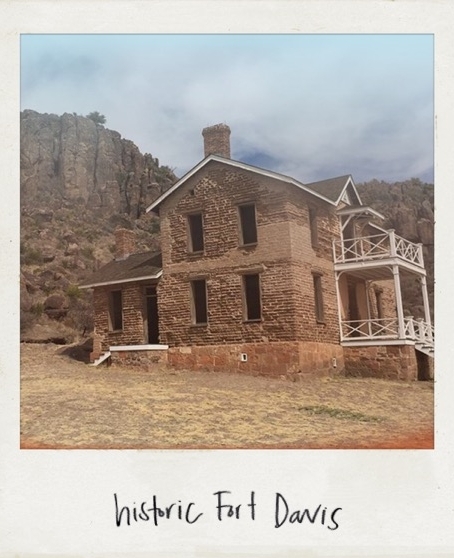 Fort Davis, known for being the tallest town in Texas (5,050 ft! ), has beautiful mountain scenery, starry skies, and is home to the world renowned McDonald Observatory. Fort Davis was in function from 1854 until 1891 to protect travelers heading west on the San Antonio-El Paso Road. Today, Fort Davis Historic Site is regarded as one of the best remaining examples of a frontier military post in the American Southwest. It is a vivid reminder of the significant role played by the military in the settlement and development of the western frontier. The Chihuahuan Desert Nature Center contains over 500 acres of semi-desert grasslands and igneous rock outcrops. Geological features include: the Modesta Canyon, a unique riparian canyon with a year-round spring, and Clayton's Overlook, a dome with spectacular views from all directions with the Geologic Exhibit at the top of the Overlook. The Nature Center offers over five miles of hiking trails, the a desert botanical garden, a cactus & succulent greenhouse, and more. The McDonald Observatory is located sixteen miles northwest of Fort Davis on Hwy. 118. The observatory is open 9-5 daily and star parties with night viewing through the telescopes are also offered at times. One of the best stargazing destinations in America. Call 877-984-7827 for a recorded message on viewing conditions and program times. Davis Mountain State Park is located 4 miles west of Fort Davis on Highway 118. The park offers mountain biking, horseback riding, ranger programs, and stargazing along with stellar views of the Davis Mountains. Also a 75 mile scenic drive through the Davis mountains leaves Fort Davis on HWY 118 and is one of the most scenic and un-crowded drives in Texas and America. With fresh made-to-order sandwiches, salads, soups, and cookies at the deli counter, this local natural foods market in Ft Davis offers a wide variety of fresh organic produce! Nicknamed the "Tiny Whole Foods" of the high desert, Stone Village Market is our go-to when it comes to grabbing a quick, healthy, meal on the go. Blue Mountain Bistro is our top choice for fine dining with a local flair in Ft. Davis. Whether you’re in the mood for Beef Bourguignon, a fabulous Ribeye, or a Grilled Salmon Filet, you can find it at Blue Mountain Bistro! They sport a full bar with top shelf liquor, assorted beers (including local favorites from the Big Bend Brewery), and fine wine samplings! Located right in the Middle of Fort Davis, Lupita's Place offers delicious Tex-Mex with a convenient dine-in area (or call ahead for orders to go!) Ask any local where to go for the best and most authentic mexican food in town, and they'll send to Lupita's. It also has a fabulous burger. Lupita's Place is open Monday-Saturday: 7am-9pm, Sunday 8am-9pm. Located inside the Davis Mountains State Park, Indian Lodge is a memorable place to stay in Fort Davis. One can explore the natural beauty of the Davis Mountains by day, and relax in a comfortable room by night. With its white adobe walls, historic aura, and refreshing pool, Indian Lodge is a welcome oasis in West Texas. The Hotel Limpia is a historic, restored 1912 hotel nestled in the scenic Davis Mountains. Complete with a courtyard garden, a glassed-in veranda, and porches donning rocking chairs, Hotel Limpia is a historic Texas gem and a peaceful place to stay. Also, Hotel Limpia is home to the only bar in Jeff Davis County- the Blue Mountain Bistro (see above). Cyclefest is arguably the best and most scenic Bike Tour in the state of Texas with beautiful vistas, easy novice routes and challenging hills. Cyclefest is a “must do” for every cyclist. Cyclists tour the Davis Mountains in this 42nd annual event- which includes routes of 27, 55, and 76 miles. The event is staged at the historic Prude Ranch in Fort Davis and is held the Third Weekend of September. The Star Party program (~ 2 hours, depending on weather & crowd size) is fun for the entire family, and is open to everyone! Reservations are nearly always required as this program frequently sells out. Enjoy night sky constellation tours and views of celestial objects through a number of telescopes (varying in size up to a 24-inch Ritchey–Chrétien telescope) in the Rebecca Gale Telescope Park at the Visitors Center every Tuesday, Friday, and Saturday evening. Tip: Be sure to dress warmly (especially for evening programs) and bring your reservation confirmation with you! The Visitors Center is open 10 a.m. to 5:30 p.m. Central Time. See Fort Davis in full spirit for the holidays with decorations in all of the newly restored historical buildings!